Born Moishe Zakharovich Shagalov (Moishe Segal) in Vitebsk, Belarus (then in the Russian Empire).Marc Chagall was born on July 7th, 1887 to a poor family from Pestkovatik, a small village in western Czarist Russia. His family name was Shagal. A few years after Marc's birth the family relocated to nearby Vitebsk, which became the chief source of subjects for Marc's paintings. His early life was spent in a small Jewish enclave that was subject to persecution and official and unofficial events of violence. Young Chagall was at odds with family and faith by breaking Mosaic law that forbids the making of graven, or representative images. Chagall studied in St. Petersburg from 1906 til 1910 and then went on to Paris where he remained until 1914. Unfortunately, while visiting family in Russia, World war I broke out, trapping him in the New Soviet Union. He prospered and wound up Commissar of Art for his village of Vitebsk in 1917. However disagreements with other artists sent him to Moscow where he designed sets for the theatre. By 1922 the Soviet Union had grown more resistant to his nonpolitical art, so Chagall, his wife Bella and daughter Ida migrated to France where he was immediately commissioned by Ambroise Vollard to illustrate Gogol's "Dead Souls". In 1937 Chagall became a French citizen, a privilege that was soon revoked when the Germans conquered France in 1941. Chagall, like many, were hesitant to accept the danger they faced as Jewish People, and as an artist he was among those condemned as "degenerate" by Hitler. In April of '41 Chagall was arrested and American intervention secured his release. he spent the war years in America. Bella died in 1944, and Chagall formed a new relationship with an Englishwoman named Virginia Haggard, who accompanied him back to Paris in 1948. They broke up in '52 and Chagall remarried Valentine Brodsky and found stability again,which he so sorely required for his work. 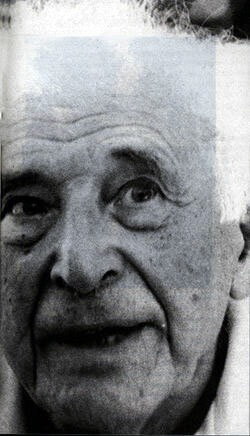 He lived a good long, prolific life until he died at the age of 97 on March 29th, 1985. In an age of constant change, Marc Chagall's single vision was a breath of fresh air. For all the styles and movements, rarely does a single artist defy comparison, fit no mold, stand alone and stand out like Marc Chagall. His is a banner that reads "Be Yourself!"